"It may seem unusual at first to foster self-control by centering on freedom of choice, but it is a very sound doctrinal approach. "While either subject may be taught separately, and though they may appear at first to be opposites, they are in fact parts of the same subject. 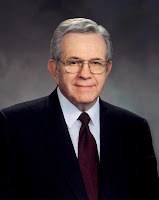 "...Latter-day Saints are not obedient because they are compelled to be obedient. They are obedient because they know certain spiritual truths and have decided, as an expression of their own individual agency, to obey the commandments of God. 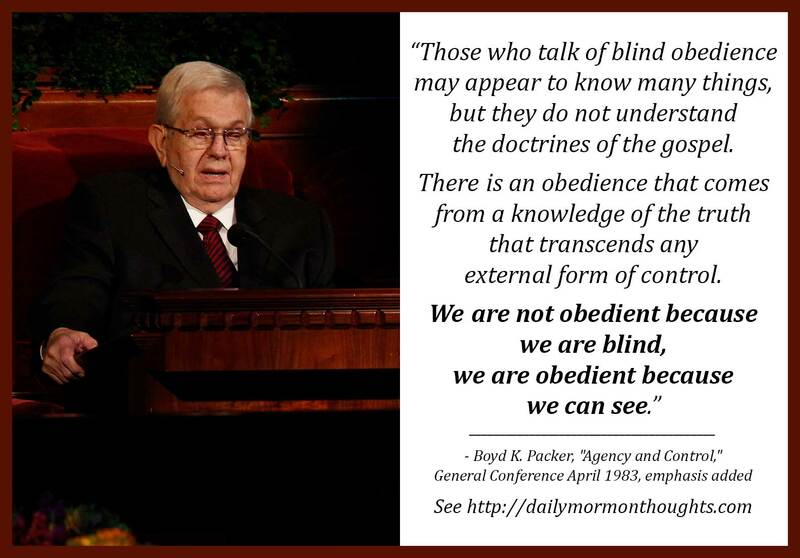 "Those who talk of blind obedience may appear to know many things, but they do not understand the doctrines of the gospel. There is an obedience that comes from a knowledge of the truth that transcends any external form of control. 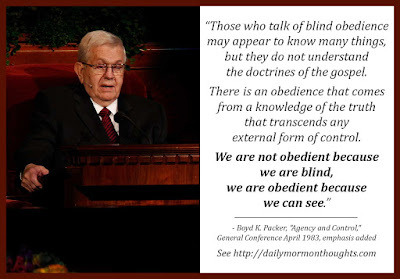 We are not obedient because we are blind, we are obedient because we can see. The best control, I repeat, is self-control." 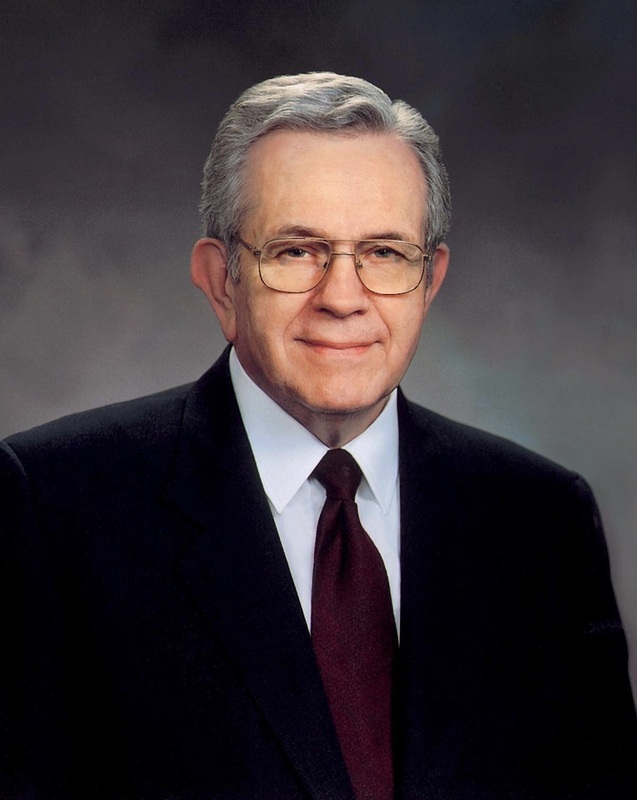 President Packer considered in this talk the goal of obtaining the obedience of others. If we want to make sure someone obeys directions or guidelines, how is that best accomplished? One option is expressed in the military setting: the dominance and intimidation that are often portrayed as the officers and leaders "control" the enlisted men. But another very different option is shown in the Gospel's approach. A loving Father invites us to follow and exercise our own self-control. As we choose to be obedient, we find joy and blessings that follow—and so we are motivated to continue in that path. The sweetest form of discipleship is choosing to willingly follow the teachings of the Master, knowing that there is wisdom and joy in that path. As we begin to see more clearly, we will know that we are choosing wisely and will continue to choose to follow that path. Labels: agency, choices, obedience, Packer Boyd K.